Buildings across the country rely on the safest and most reliable elevator parts to meet local code requirements while also ensuring that all guests and employees are safe at all times. If your business is in need of high-quality elevator entrances and doors, it can help to find a product that is approved by an Accredited Elevator/Escalator Certification Organization (AECO). The alternative to this approach is to gain approval from your local Authority Having Jurisdiction (AHJ), which sets unique requirements. When you consider that there are over 130 AHJs in North America, it’s easy to see why relying on a national entity can be so beneficial. 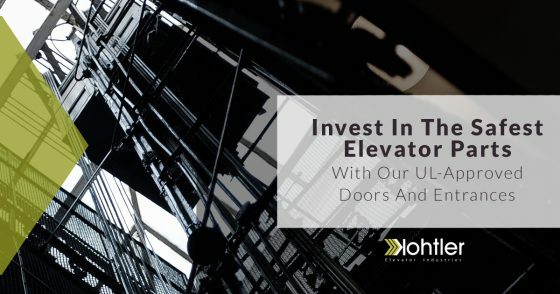 Kohtler Elevators is here to serve as your premier source for elevator cabs, entrances, and doors, and our company is proud to announce that all of our products are UL-approved. Today, we’ll discuss the value of being certified by an AECO, as well as the beauty of each of our unique designs. If you’re ready to find UL-approved elevator doors and entrances, be sure to contact us today! Underwriters Laboratories’ (UL) purpose is to inspect elevator parts across the country, working to ensure that each stringent standard is satisfied completely. UL will review and test elevator designs from all over to deliver a certification for both their approval and that of the American Society of Mechanical Engineers’ (ASME) standards for proper safety and durability outcomes. This process helps to ensure that consumers are well-informed of the level of quality of their elevator doors and entrances. Purchasing a product that does not conform to nationally mandated standards can result in unfavorable outcomes when working with your local AHJ. UL is tasked with performing initial certifications of elevator parts, and part of their commitment as an AECO comes from continually sampling manufacturer products to ensure UL-certification is met. As we have stated previously, it can prove difficult trying to obtain a certificate of approval from your local AHJ. Kohtler Elevators’ various products have passed UL inspections, providing peace of mind for clients across the nation. This efficient process saves time and stress for building managers who are dealing with a variety of other tasks. Kohtler Elevators relies on the best materials and most precise manufacturing processes to create products that are built to last beautifully and reliably. Our dedication to delivering the highest level of quality shows in the beauty, durability, and affordability of all of our elevator parts. We combine our high-quality components with the best customer service in the industry to ensure you are satisfied with your purchase from us. UL-approved elevator entrances and doors can do much to speed up your process of approval for obtaining a new elevator cab system. If you’re in the market for modern elevator parts to create a smooth, comfortable system for your employees or guests, Kohtler Elevators is here to help. Contact us today to learn more about our high-quality products, and be sure to ask us how our UL approval can benefit your business!